20 ft. x 20 ft. Pole tent installed with stakes. 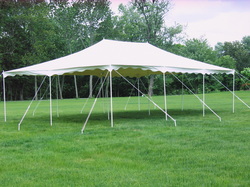 This tent requires at least a 30 ft. x 30 ft. area for set up and 12 stakes to anchor. It is available in white or white and yellow stripes. Sidewalls are optional. 20 ft. x 30 ft. Pole tent installed with stakes. 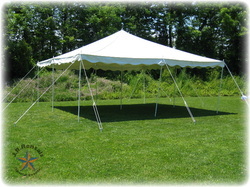 This tent requires at least a 30 ft. x 40 ft. area for set up and 14 stakes to anchor. It is available in white . Sidewalls are optional.